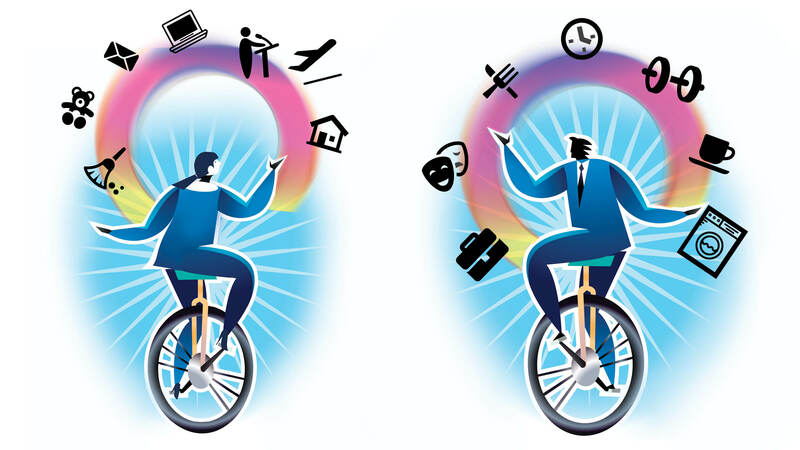 Home › News › Research › Do Women Juggle Work-Life Balance Better Than Men? Juggling home and work commitments is never easy, and yet there’s been surprisingly little research into how either demands—or support—at home or work may spillover into the other context. Does a frustrating or combative workday negatively affect family life that evening, for instance? Or if your partner is emotionally supportive when you both get home, will you “pass it on,” and be more supportive of colleagues the next day? And, are men and women affected in the same ways? A new paper published in the Journal of Applied Psychology, provides some provocative answers. In the first of two studies conducted in the Netherlands, Drexel LeBow’s Jeffrey Greenhaus and his co-author, Lieke ten Brummelhuis at Simon Fraser University, asked both members of 26 heterosexual working couples, most of whom had children, and who had been together for an average of 17 years, to fill in questionnaires each day for five days. Immediately after work, they answered questions about their emotional work demands and support that day—whether they’d been confronted with demanding clients or co-workers, for example, or whether a colleague had made time to listen to their problems. Just before going to sleep, they then filled in another questionnaire, which asked about interactions at home after work. (They had to indicate how much they agreed or not with statements such as “Today, my family solved problems together.”) They also completed a brief survey that assessed both how much support they felt they’d received from their partner after work that day, and how much support they’d been able to offer their partner—cheering them up, or listening while they talked about work problems, for instance. The results showed some intriguing gender differences. On days when the men had heavier work demands, they admitted offering less support to their partners—and their partners backed this up, reporting they’d received less support, and that the quality of the family relationship was lower. But when the women had had a tough day at work, there was no impact on support or family life. What’s more, when the women reported receiving more emotional support from colleagues at work in the day, they also said that evening that they had offered their partners more support, and, supporting the honesty of these claims, their partners also reported that the quality of the family relationship was higher. This positive carry-over of support from work to the home did not occur with the men. To investigate what impacts home demands and emotional support—or lack of it—might have at work, the researchers then recruited 64 co-worker pairs for another five-day study. At the start of each day, all participants filled in a questionnaire that asked about home demands and support. Then, in the afternoon, they filled in another survey that asked about what support they’d offered their paired co-worker that day, and also about the quality of the team relationship. The researchers found a similar pattern of results to the first study: men with heavier home demands provided less emotional support to their co-worker, and team relationship quality was rated as lower by both members of the pair. For women, heavier home demands did not negatively affect the emotional support they were able to offer their co-worker—and, when they got more support at home, they offered more support at work, and the quality of the team relationship improved. Again, this positive association was not found for the men. This might be because, according to gender norms, women are expected to provide more emotional support and put more effort into maintaining relationships than men are, the researchers speculate. As they also note, equal roles for men and women are more valued in the Netherlands than in some other countries, such as the U.S. “It is possible that gender differences in a North American sample may be even more pronounced than in our studies,” they write. There are reasons to be cautious about some of the conclusions. Notably, the data on support provided and received and on relationship quality (at home and at work) was collected at the same time, so it’s impossible to be sure of the direction of the relationship. But as the researchers write, this short-term study does provide several leads for future research, which might explore the observed gender differences, and also whether there are strategies that might help to turn the negative processes observed in men into positive ones. Greenhaus’s paper titled How Role Jugglers Maintain Relationships At Home and At Work: A Gender Comparison was published in the Journal of Applied Psychology in December 2018. This summary was republished with permission of the British Psychological Society’s Research Digest. In partnership with TechGirlz, Drexel LeBow welcomed girls from middle schools in the greater Philadelphia area for a technology workshop about data and analytics. TEDx LeBow gave four students a platform to address the changing roles of identity and diversity in their classrooms, workplaces and communities.